A wonderful winter meal. The squash and dried cranberries make it sweet so children and adults alike will enjoy. Serves four. 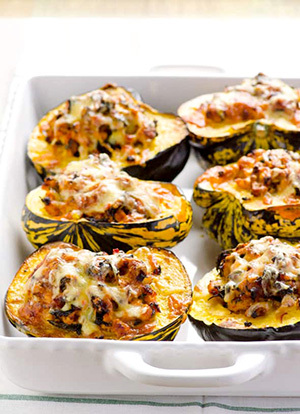 Roast the whole squashes on a pan for 30 to 45 minutes or until tender. Halve the squashes and remove the seeds. Heat the broiler. Saute the sausage in a large skillet. When brown and crumbly, remove from the pan. Add oil and cook all of the veggies until tender. Add the sausage, cooked rice, spices, Parmesan cheese and cranberries, mixing well. Divide the mixture evenly into the squash halves. Sprinkle with the Swiss cheese and broil for five minutes or until the cheese is melted. Serve warm. “Sometimes your joy is the source of your smile. Sometimes your smile is the source of your joy!” — Thich Nhat Hahn.